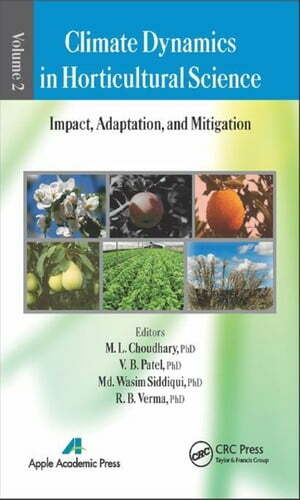 Collins Booksellers - Climate Dynamics in Horticultural Science, Volume Two: Impact, Adaptation, and Mitigation by Choudhary, M. L., 9781498701303. Buy this book online. Climate change and increased climate variability in terms of rising temperatures, shifting rainfall patterns, and increasing extreme weather events, such as severe drought and devastating floods, pose a threat to the production of agricultural and horticultural crops-a threat this is expected to worsen. Climate change is already affecting-and is likely to increase-invasive species, pests, and disease vectors, all adversely affecting agri-horticultural crop productivity. Advances in agricultural knowledge, science, and technology will be required to develop improved crop traits, such as temperature, drought, pest, and salt tolerance. This two-volume set gives readers an understanding of the issues and makes suggestions for ways to mitigate adverse climate change effects on crops. The focus of Volume 1: The Principles and Applications in Horticultural Science is to identify impacts and suggest appropriate and effective adaptation and mitigation strategies. Volume 2: Impact, Adaptation, and Mitigation focuses on the impact of climate change on horticultural crops and offers ways to adapt practices to mitigate adverse effects. Together, the two volumes offer a diverse selection of chapters that address issues of importance to those in the horticulture industry, researchers, faculty, and others.